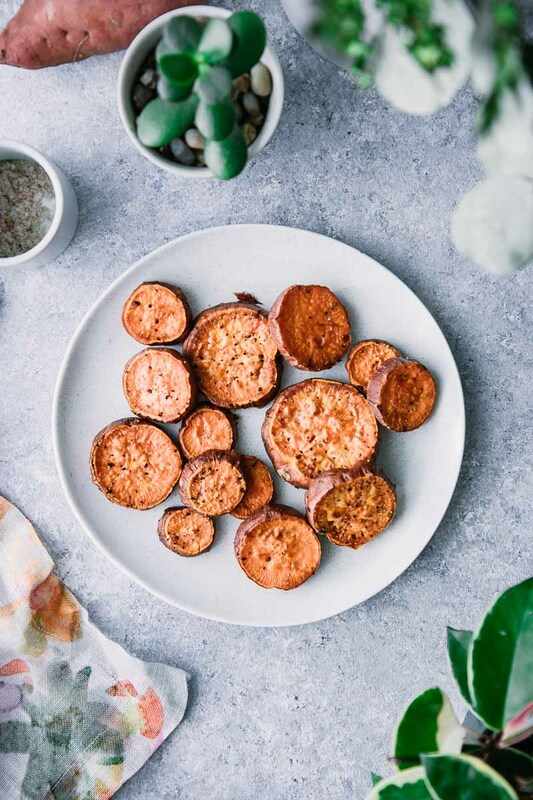 Roasted Sweet Potato Rounds, a simple baked crispy sweet potato slices recipe with just four ingredients and ready in only 45 minutes. Perfect as a simple side dish or salad topping and great for meal prep! Love baked sweet potatoes but hate waiting over an hour for them to be ready? I feel your pain. Sometimes I buy sweet potatoes with good intentions, but they end up lonely and forgotten in the back of my crisper drawer because baking whole potatoes can take more time than I’m willing to put in on busy weeknights. 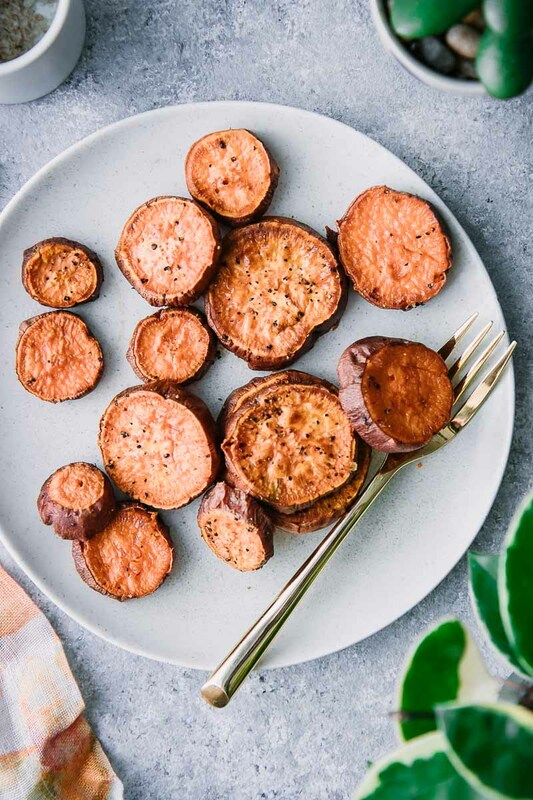 If this sounds familiar, I have the perfect recipe for you: baked sweet potato slices that are crispy on the outside, soft on the inside, and ready in only 40 minutes in the oven. Did I mention this low maintenance recipe only has four ingredients? Ready to learn how to make our go-to healthy baked sweet potato wedges recipe? Let’s do it! These baked sweet potato wedges are as simple as it gets, with a prep time of only five minutes and are low maintenance while baking. First, preheat oven to 425 degrees F (230 degrees C). While the oven is preheating, wash the sweet potatoes and remove any growths or blemishes, but do not peel them. The potato rind helps keep the wedges crispy and held together when baking — and is a good source of fiber and nutrition. Cut potatoes into 1/3 inch (1 cm) round slices. Next, drizzle olive oil onto a large sheet pan and spread the oil until it’s even on the baking sheet. Then, add the potato rounds to pan with one side facing down to coat with oil, then flip all potato medallions to make sure each side is lightly oiled. Sprinkle the potatoes with salt, pepper, and any additional desired spices. I like to add a bit of paprika and garlic powder, but experiment with your favorite spices to make them your own. Finally, bake in oven for a total of 40-45 minutes, flipping once about halfway through. Both sides should be lightly browned and crispy on the edges. After I put the potatoes in the oven, I set the timer for 20 minutes, then flip and bake for another 20 minutes. Then I set a timer for five minute intervals if they need a few more minutes after that to get crispy. Are roasted sweet potatoes healthy? 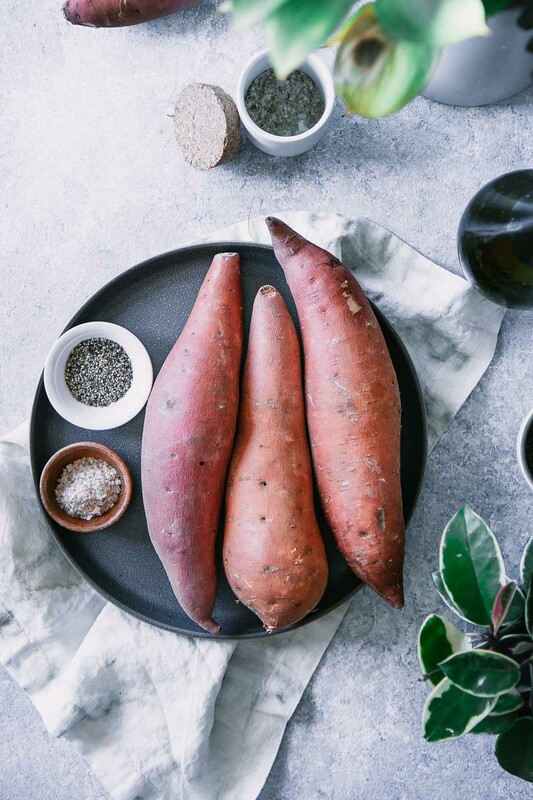 Potatoes get a bad rap for being high in carbohydrates, but sweet potatoes and yams are actually a nutritionally-dense and sweeter alternative to traditional white potatoes. One cup of sweet potatoes is only 115 calories, contains 4 grams of fiber, 2 grams of plant-based protein, is an excellent source of vitamin A, and a good source of potassium. This recipe bakes the sweet potatoes rather than frying them, which reduces unnecessary fats. However, we are adding a bit of healthy plant-based olive oil and just a sprinkle of salt and spices to add flavor, but not overpower the potatoes. 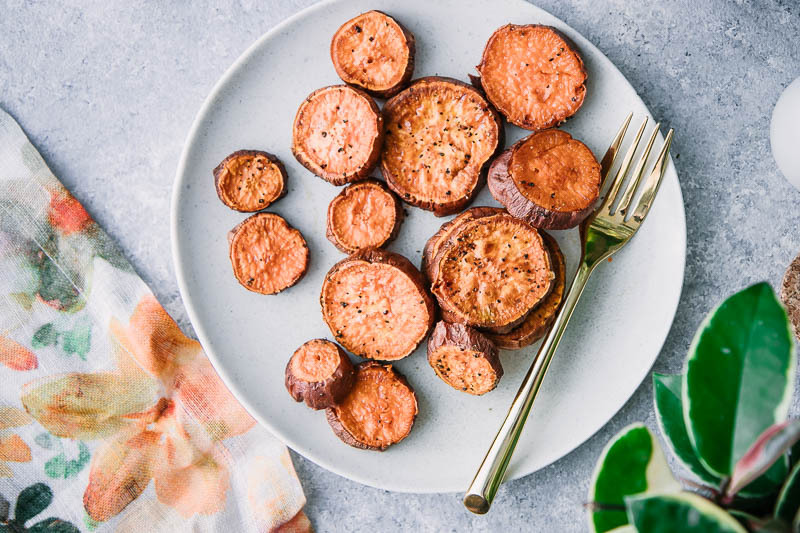 Pair roasted sweet potatoes as a side dish with lean meats or plant-based protein entrees, or as a topping for salads and bowls. 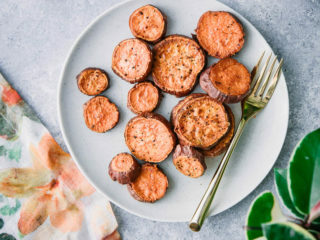 Baked sweet potato rounds are super simple to make and about as hands-off as it gets, but there are a few tips and tricks to make preparing them even easier. Recommended tools: you’ll need a large sheet pan or other baking sheet to cook the potatoes, and a spatula or fork to flip. Choose long and thin potatoes. Bulky or thick potatoes will make for huge slices, so choose a long and thin potato so the round slices are uniform and easy to eat in one or two bites. Oil in the pan or in a bowl? My method of oiling the potato rounds right on the pan reduces the need to toss them in oil in a large mixing bowl (less dishes! ), but both ways work. The point is just to oil both sides before baking. Cut potatoes any way you’d like: Don’t want to make rounds, or “medallions?” Cut potatoes long and thin into wedges, squares, or whatever shape you’d like. The cooking instructions are still the same. Try toppings! These roasted sweet potato slices are great topped with cheese, vegetables, herbs, and sauces. Experiment and make easy to grab appetizer bites for your next party. perfect as a side dish and are a great topping for salads and bowls. easy to prep (only five minutes!) and are low maintenance; just throw in a pan, flip, and they’re done! a more nutritionally dense alternative to traditional white potatoes, and pack more fiber per serving. great reheated or even eaten cold on top of salads the next day. 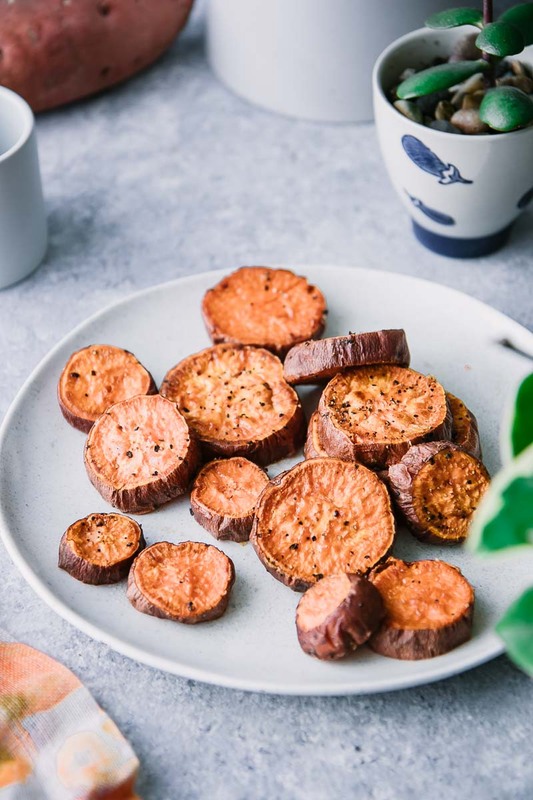 Love this simple roasted sweet potato recipe? Check out our other simple side dishes, like these Honey-Harissa Pan-Roasted Carrots or Maple Mustard Roasted Brussels Sprouts, both easy side dishes for busy nights. 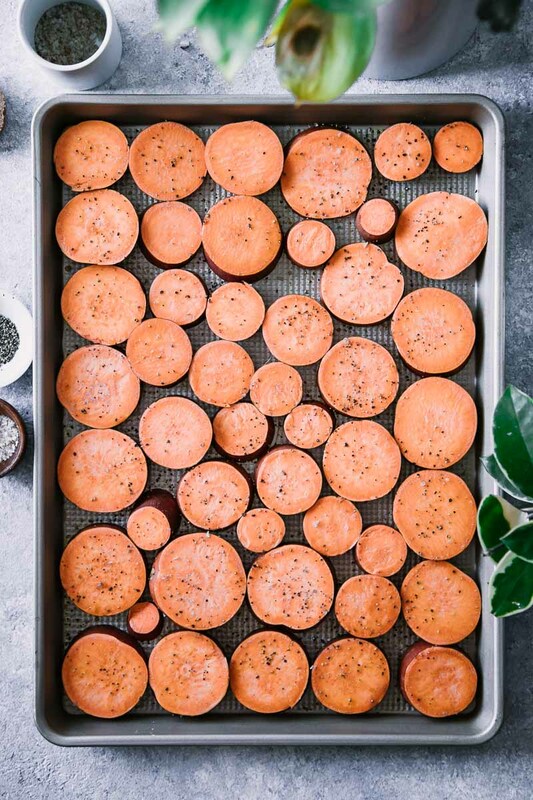 Did you make these Roasted Sweet Potato Medallions? Leave a comment below and rate the recipe to let us know how it turned out. Save this baked sweet potato wedges recipe for later by pinning to your favorite simple side dish Pinterest board. Make sure to tag me on Fork in the Road’s Instagram to show me your sweet potato creations! Optional spices: paprika, cumin, cayenne, cinnamon, garlic, etc. Preheat oven to 425 degrees F (230 degrees C). Wash sweet potatoes and remove any growths or blemishes, but do not peel. Cut potatoes into 1/3 inch (10 cm) round slices. Drizzle olive oil onto large sheet pan and spread until even on baking sheet. Add potato rounds to pan with one side facing down to cover with oil, then flip all potato medallions to make sure each side is lightly oiled. Sprinkle with salt, pepper, and any additional desired spices. Bake in oven for a total of 40-45 minutes, flipping once about halfway through and until both sides are lightly browned and crispy on the edges. 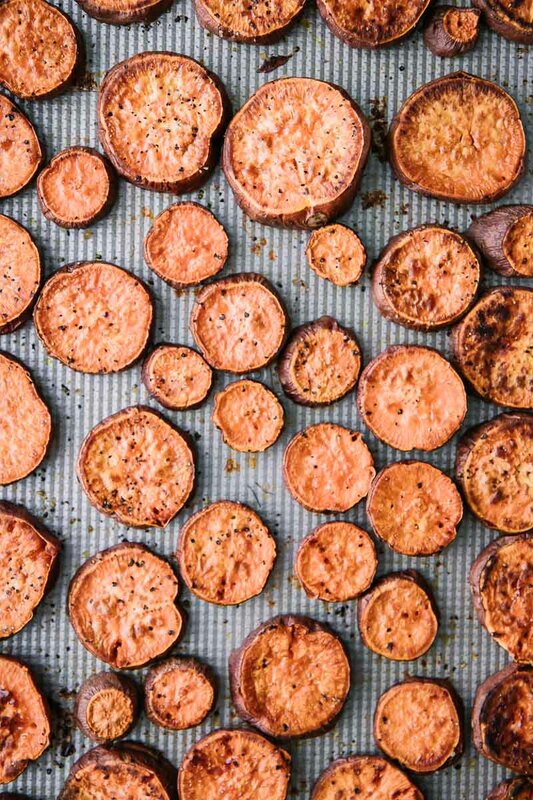 Prep Ahead: Cut sweet potatoes ahead of time for easy baking on busy weeknights. Leftovers and Storage: Cool roasted sweet potatoes and store in an airtight food storage container for up to five days. To reheat: Reheat in the microwave or heat a skillet filled with leftover potatoes and flip to warm each side. Potatoes are also great cold on top of salads and bowls. Nutrition notes: This baked sweet potato recipe is an excellent source of vitamin A and C, and a good source of dietary fiber per serving. Pair potatoes with a lean or plant-based protein, a vegetable side, and a healthy fat for a complete meal.